You hope you never fall, but always dress like you expect to fall. Proper riding gear is essential for your safety. Remember, your life is on the line. If you ever crash, the natural reflex is to catch yourself with your hands. A good pair of riding gloves with reinforced knuckles and palms are a must. Full fingered protection is best but there are other options as well. I wear short gloves during the summer months and I wear gauntlets in the colder months. Gauntlets provide more protection regardless of the temperatures, so don't think they are just for winter riding. You can browse a huge assortment of riding gloves here. As far as footwear goes, reinforced toes and ankle protection are the top priorities. Motorcycle specific riding shoes/boots are best but any rugged shoe with ankle protection is better than tennis shoes. Never, ever ride barefooted or in flip flops. If you ride frequently, you will eventually get caught in the rain. We always carry our rain suits with us, they stay on the bikes all the time. You can always hope that there will be an overpass you can duck under, or a service station with a covered island, but you never know when the rain will come. We use the Nelson-Rigg Storm Rider SR6000 rain suits and rain boot covers. We've had great success with Nelson-Rigg gear over the years so that is why we chose these rain suits. They look good, they don't leak and they are easy to put on and take off. You can read more about these rain suits on this page. Every time you get on a motorcycle or scooter and venture onto public roads, there is a risk of an accident. We all hope we never have one but there is a reason they are called "accidents". 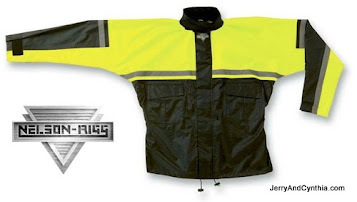 If you plan on taking a long ride, then you need to dress accordingly. If you are just running to the corner market for a loaf of bread, then you probably don't need a full racing suit. Gear is available in many styles and price points. There is cheap Chinese crap and top of the line equipment. Since you are the one buying it, you ultimately get to decide what you wear and how much you spend. Don't let issues like cost, hot weather or laziness prevent you from being properly protected when you ride. While you may not value your life, there is likely someone else who does so keep that in mind. It's the law and don't be stupid! You only have 2 eyes and you want to protect them. You do not want a bug hitting you in the eye at 55 MPH, or a rock, or a bird. Prescription glasses or sunglasses are better than nothing but a shield over your face is best. Goggles are also outstanding eye protection. Don't skimp here if you value your ability to see. Even if your state doesn't require a helmet when riding, you are better off with one than without. Do a quick Google image search for "motorcycle wreck no helmet" and you will see (WARNING: GORE/DEATH). You can choose a half helmet, 3/4 helmet or full face helmet. Personally, we use a modular full face helmet so we can open the front when we stop. The more your head and face is covered, the safer you will be. Spend whatever you feel your head is worth... for us, our heads are worth $200 each. We wear Bell Revolver EVO helmets. If you ever fall at highway speeds, you will tumble and skid until you stop. Pavement is hard, very hard and it is the quickest way to remove a tattoo... and skin, and bones. I would much rather be skidding along with a layer of protective clothing between me and the pavement. 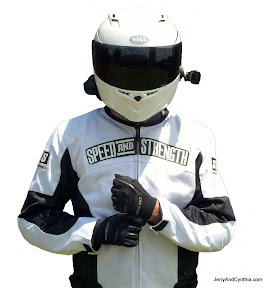 A good jacket (mesh, textile or leather) with proper CE rated armor at the shoulder, elbows and back along with a good pair of riding pants with hip and knee armor is optimal. That fateful day when you think it is too hot or too much trouble to put on your jacket and pants, just might be the day some idiot texting while driving swerves into your lane and causes you to crash. Do a quick Google image search for "road rash" (WARNING: GORE). You do not want that to happen to you. They make some really good looking jackets that you will be proud to wear every single day. Just see how good I look in that image above! I dress like that when riding my humongous Can Am Spyder RT-S or my nimble little Kymco scooter. Once again, get the type of material you prefer and spend as much or as little as you want. But don't ride in a t-shirt, shorts and flip flops. It's just not worth the risk. You can browse all sorts of riding gear and accessories at Amazon.com. Go shopping today!